The Low-Down: Walmart Expands Grocery Delivery To 100 Cities Covering 40% of US Households. Will Amazon Care? Walmart Expands Grocery Delivery To 100 Cities Covering 40% of US Households. Will Amazon Care? This is catch-up rather than innovation. Yes, leveraging the power of Walmart's farflung retail network - finally - makes sense. But rivals like Costco and BJ's Wholesale are also rolling out home delivery. And Amazon's Prime service combined with its Whole Foods network keeps it ahead financially and operationally. Shoppers can make their purchases on the grocery section of Walmart's website or through the Walmart Grocery app. A minimum purchase of $30 is required, and customers will pay a $9.95 delivery fee. If they place their order by 1 p.m., customers can get their fresh produce or other items at their door within three to four hours. 800 Walmart stores and 18,000 employees will fulfill the online grocery orders, with services like Uber helping to ferry the groceries to customers. Walmart shoppers living in major cities around the country will be able to get their groceries delivered to their door by the end of this year, as the retailer expands a service that could give it a leg up in its ongoing battle with e-commerce giant Amazon. Already available in six U.S. markets — Phoenix, Dallas, Orlando, Tampa, Denver, and San Jose — the service will become an option for more than 40% of U.S. households in more than 100 metro areas, Walmart says. 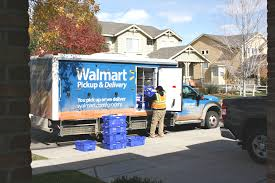 “We will be able to deliver fresh groceries to the doorsteps of millions of Americans,’’ says Tom Ward, vice president of digital operations for Walmart U.S.
Walmart will provide the locations of the new markets as service begins over the next few weeks. Shoppers can make their purchases on the grocery section of Walmart's website or through the Walmart Grocery app. A minimum purchase of $30 is required, and customers will pay a $9.95 delivery fee. If they place their order by 1 p.m., customers can get their fresh produce, seafood or other items dropped at their door within three to four hours. The grocery aisle is emerging as a critical battleground between retailers and e-commerce giant Amazon, which made an aggressive push into the space last year when it purchased Whole Foods Market for $13.7 billion. Walmart has been leveraging its own network of stores — enough that one is within 10 miles of 90% of U.S. households — by offering shoppers the ability to pick up groceries ordered online at 1,200 locations. That number will jump to more than 2,200 by the end of 2018. Roughly 800 Walmart stores and more than 18,000 employees will fulfill the online grocery orders, with services like Uber helping to ferry the groceries to customers' doors. Sam's Club, the membership warehouse store arm of Walmart, teamed up with delivery service Instacart last month to offer same-day drop-off of fresh vegetables, meat and other items to customers in Austin, St. Louis and Dallas-Fort Worth. Meanwhile, Sam's Club rival Costco launched two new delivery options in October, offering a two-day window for nearly 500 non-perishable items and same-day delivery of roughly 1,700 products, including fresh groceries, for hundreds of stores. And on Tuesday, BJ's Wholesale Club said that it will be offering same-day delivery of meats and produce, along with diapers and other items, at all of its 215 clubs by the end of next month. The same-day service is currently available at more than 70 locations.